We were able to follow some spectacular migratory movements of our seven GPS-tracked Swallow-tailed Kites. With precarious over water flights, stopovers in the Yucatan Peninsula, quick and safe crossings over the high Andes Mountains, and lots of extra time spent in the Amazon, most all of our tracked birds have made it to their wintering grounds. 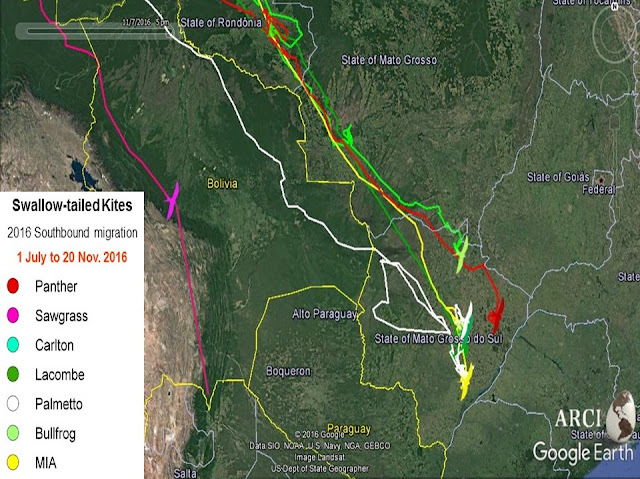 Migratory paths of seven Swallow-tailed Kites GPS tracked from breeding locations in the U.S to wintering locations in Brazil and Bolivia. Five of our birds are in Mato Grosso do Sul, Brazil. Four of the five are in locations they used in previous years. Bullfrog is near two big rivers in eastern Mato Grosso do Sul, the Rio Correntes and Rio Ápore. Panther is 170 miles to the south-southeast of Bullfrog, near the town of Água Clara. 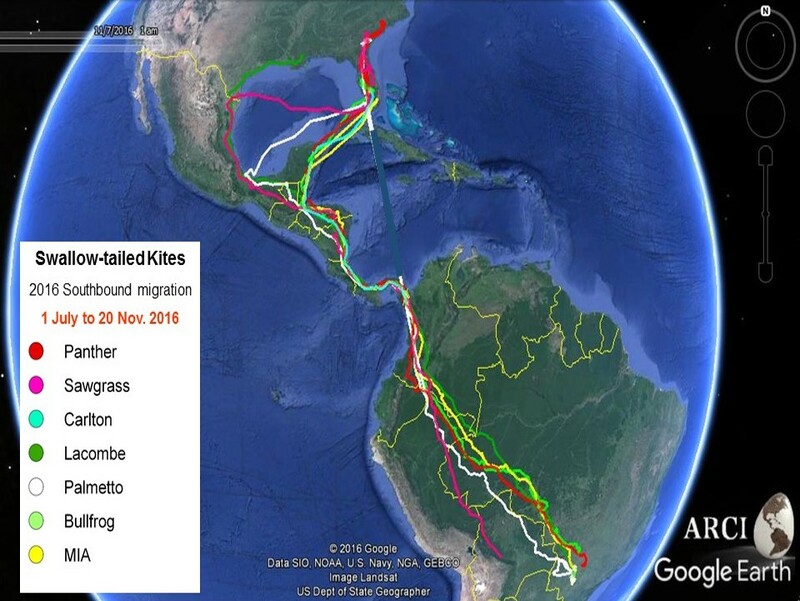 Winter locations for seven GPS-tracked Swallow-tailed Kites in South America, November 2016. Lacombe, Palmetto and MIA have been sharing the same exact roost and foraging areas 100 miles east of Panther, in the mixed agricultural and ranch lands near Ribas do Rio Pardo. Both MIA and Palmetto also have been to an area 100 miles south near Angélica, where they are roosting within a homestead on ranchland. It is amazing to see that birds from scattered breeding areas - in this case Louisiana, South Carolina and Florida - end up wintering together on the exact same farms over 5,000 miles from their nest sites! Sawgrass migrated along a more westerly path through Bolivia. Her last location was on the Argentinian border in a location where we have not seen our GPS-tracked birds go before. Sawgrass is one of three Swallow-tailed Kites that we tagged with cell-phone (GSM)/GPS tracking devices, which we had not previously used. The other four tracked kites are carrying satellite/GPS units. Carlton (another of the three kites with GSM/GPS devices) is a bit of a mystery. We last received data from him in early September while he was near the Panama/Colombia border. We hope that his transmitter will soon be detected by the cell-phone system and reveal where he has been. Migration is the most demanding and dangerous part of the Swallow-tailed Kite’s annual cycle. We hope that this bird has successfully completed its southbound journey and has found a safe place to spend the northern winter.